Some quick notes on colour management, between After Effects and Illustrator. 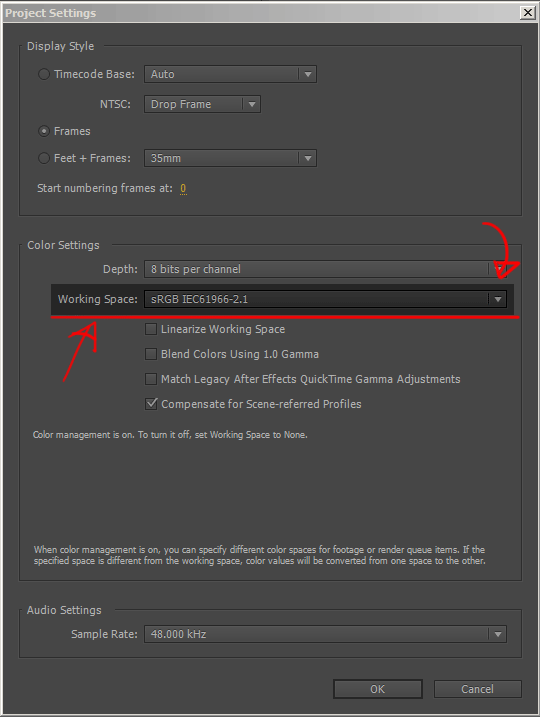 In After Effects, you’ll find a list of available colour spaces under the Color Management button, in Project Settings. There is a really useful button, hidden away in the “Save As” dialogue, in Illustrator. If you have just been given an Illustrator file, with about a hundred-million art-boards in it, and you need to find a way to import it all into After Effects; then this can be good thing to know! (it took me years to find this button). Why is it Important to Correctly Prepare the Graphics? If the graphic elements can be supplied in way that makes it easier for an animators to use straightaway, then it can save whole days worth of animation time. An animator’s time can be wasted by having to wade through unfamiliar/unorganised Illustrator files, converting file formats, picking through thousands upon thousands of unlabelled layers, and generally having to re-build graphics from scratch. None of this stuff is complicated, but when there is a lot of it, then it can accumulatively add up to quite a lot of lost time. Therefore, If you’re a graphic designer, and if you’re able follow these simple concepts and rules, then you shall become an After-Effects-er’s new best friend, forevermore! 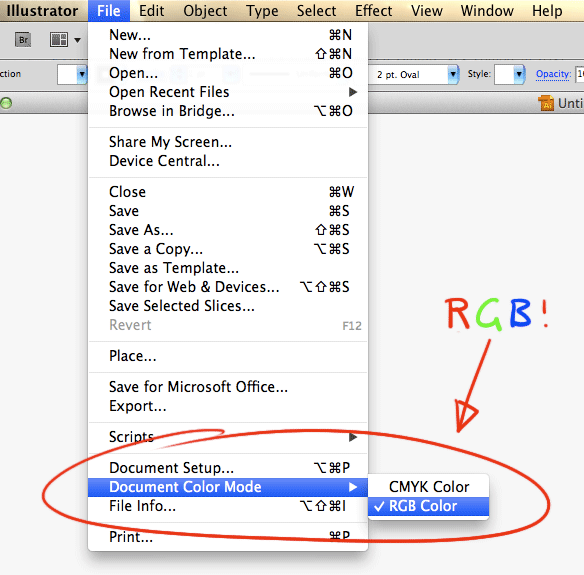 Files should be in RGB colour mode, and not CMYK. 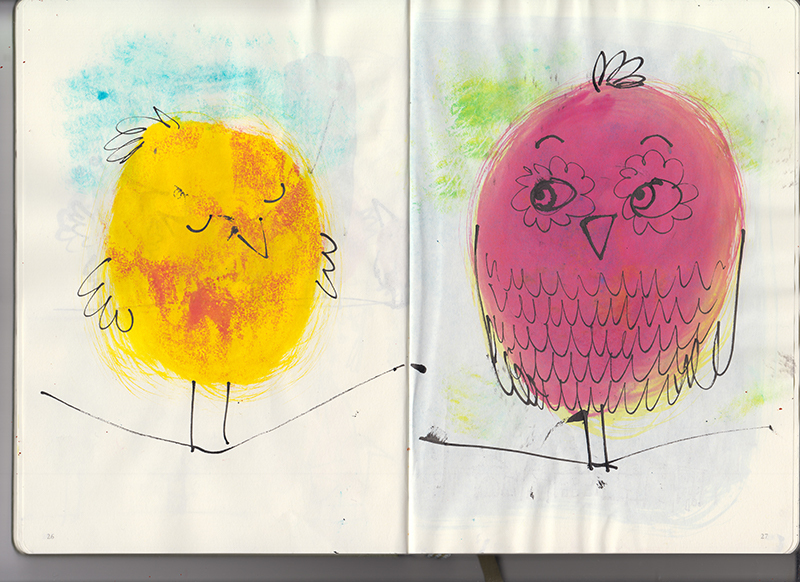 CMYK is for fancy-pants print work, and is not suitable for animating with! 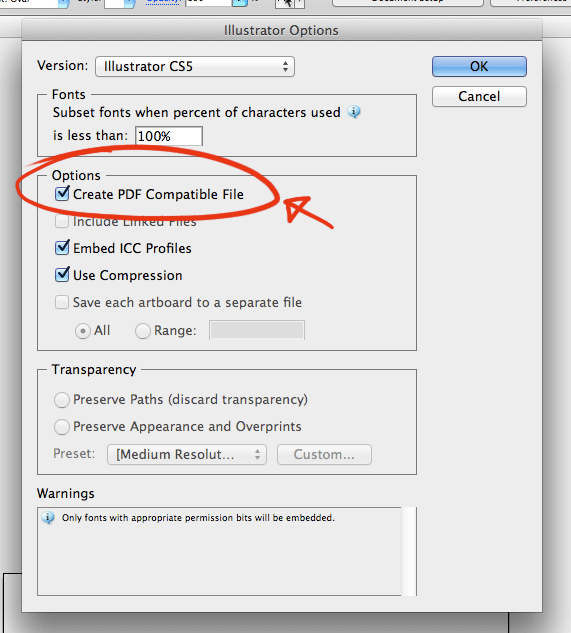 Files should be saved in Illustrator’s own .ai format, with PDF compatibility turned on. 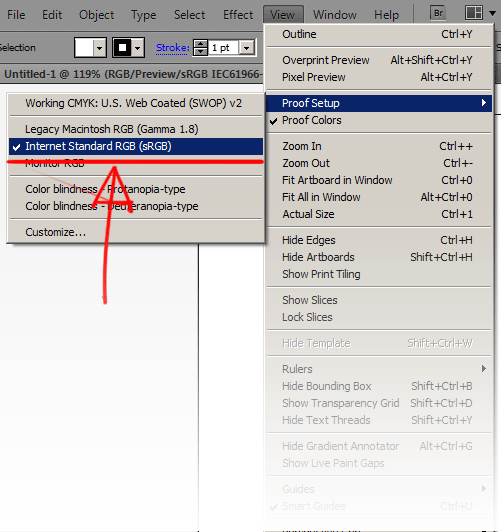 Check that PDF compatibility is turned on. Don’t put everything into one huge mega file! It makes it easier for an animator to find the necessary elements, and work with them. If necessary, It’s much easier to make small edits to the graphics later on in the project, without totally wrecking the animation. If a file becomes corrupt, then at least it’s only that one graphic element that gets fried, and not all the elements in the whole project. It does happen! Think of, “eggs”, “baskets”, and “putting in”. Files should named and organised according to their purpose, eg; “user_interface_elements.ai”, or “map_timbuktu.ai”. They should be placed in the relevant folder, eg; “…/shot_xxx/elements/…”. Graphic elements should be split out across separate files, and saved in the shot elements folders, with relevant filenames. The links will break when Illustrator files are swapped between Macs and PCs. Try to embed them, or even better, don’t use them at all! Or at least, not for graphics intended for import into After Effects. A much better option is to provide the associated files separately, and then they can be imported and composited directly in After Effects. Good luck in finding that missing file! Multiple artboards are excellent for storyboarding, and trying out different ideas, but from an After Effects point of view, they can be a bit of a nightmare to work with. It’s much better to put things into separate, well organised files, as opposed to just handing everything over in one huge impenetrably tangled mass of stuff (also, see above, “Don’t put everything into one huge mega file!”). 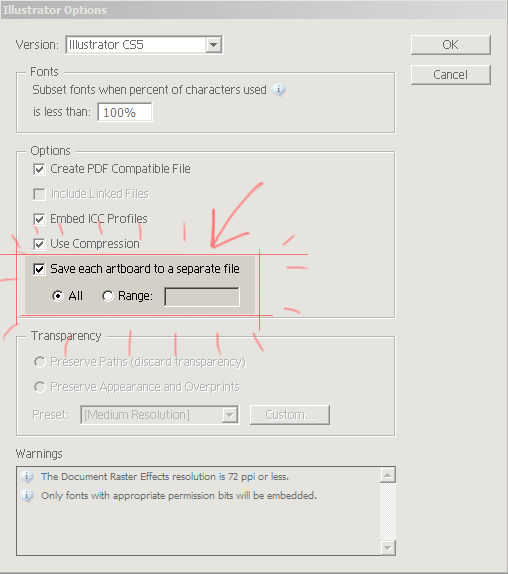 You can use the “Save each artboard to a separate file” option in the Save dialogue to help quickly split up your artboards into separate files. 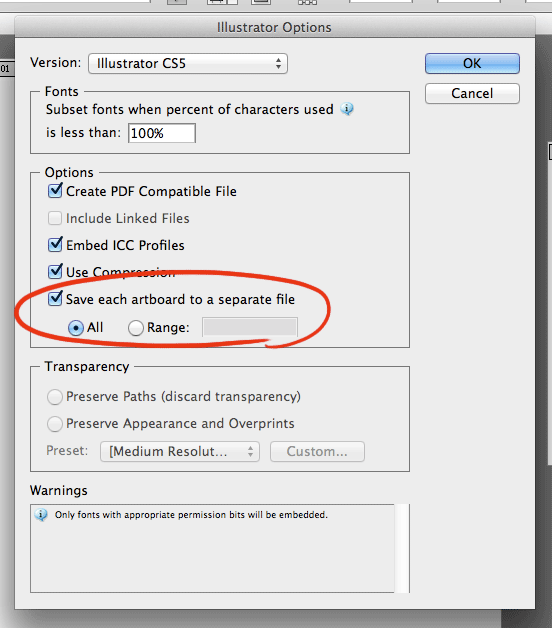 Illustrator save dialog, showing the “Save Artboards as Separate Files” tick box. Don’t fiddle with Illustrator files that are already being used in After Effects! Unless you really know what you’re doing. Minimal colour alterations, if done VERY carefully, can be ok. The slightest dimensional change, however, (eg; position, scale, rotation, anchor, etc) can destroy weeks of delicate After Effects work. Don’t do it! Unless you want to make the After Effects person cry. There are some differences in the way layers work, between After Effects and Illustrator. 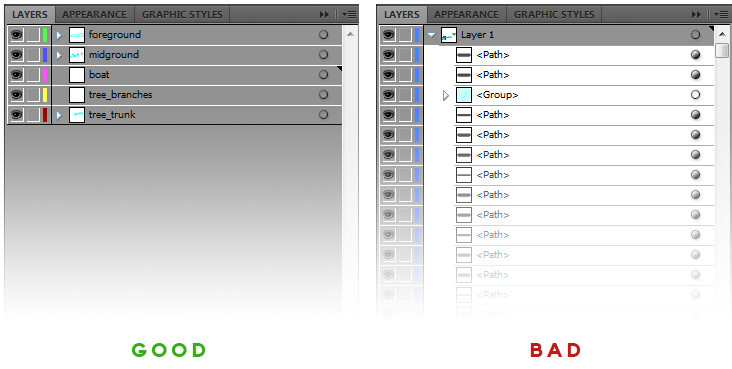 The most obvious difference, is that After Effects will only see the top-level layers of an imported Illustrator file. 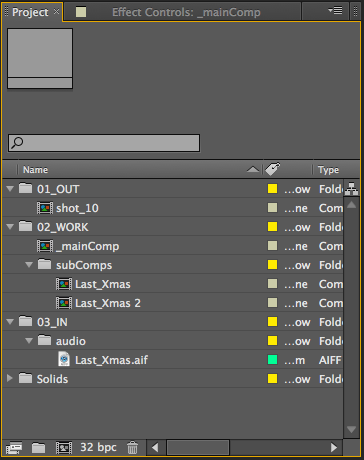 After Effects won’t see the nested layers in the composition timeline; These will all be flattened into a single layer. Comparison between a layer in Illustrator and After Effects. Note that the nested layers in Illustrator are not carried through to After Effects; They are flattened into in a single footage layer. Consequently, anything that needs to be animated as a seperate elements, must to be in a suitably named top-level layer of it’s own. It should not be nested away somewhere. This can help prevent many wasted hours of poking around to find the right elements. 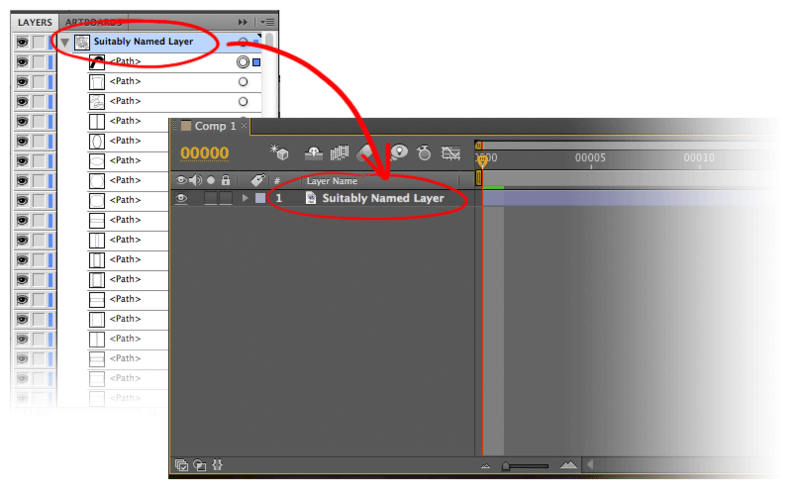 You can use the “Release to Layers” command to quickly arrange a large amount of nested elements into their own layers. 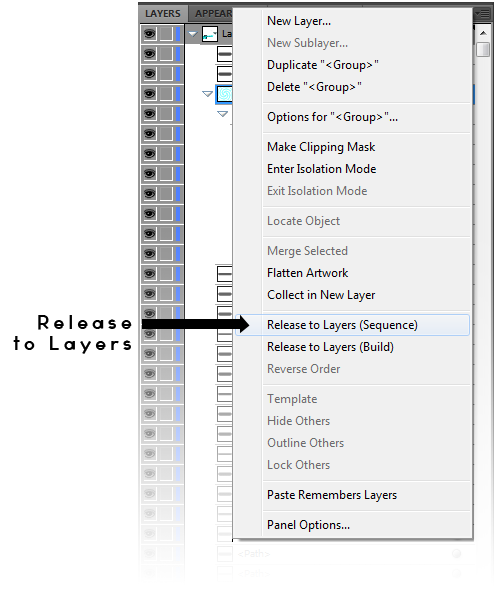 Use the Release to Layers option in the Layers menu, to quickly place a large number of selected graphic elements, such as paths, into their own separate layers. Remove all layer effects, eg; drop shadows, blurs, glows etc. These work better when created and manipulated directly within After Effects. These seem to confuse After Effects, and generally cause lots of grief. A much better, cleaner, option is to provide the necessary bitmaps as separate files, which can then be masked and composited directly in After Effects. This can also be an issue if you’re intending to use bitmaps to add a bit of texture to graphics. In these cases it’s usually better to use Photoshop to create the elements, rather than Illustrator. Anything bitmappy and textured should really be going through the Photoshop route anyway. When designing maps and backgrounds, it’s always really useful to provide more material than just that shown within the camera frame. Remember, in animation, everything moves! Therefore, the wider parameters we can have to work within, the better. Don’t put important annotations too close to the frame edge. Logos needs to be in vector format, or hi-res bitmaps with alpha channels. 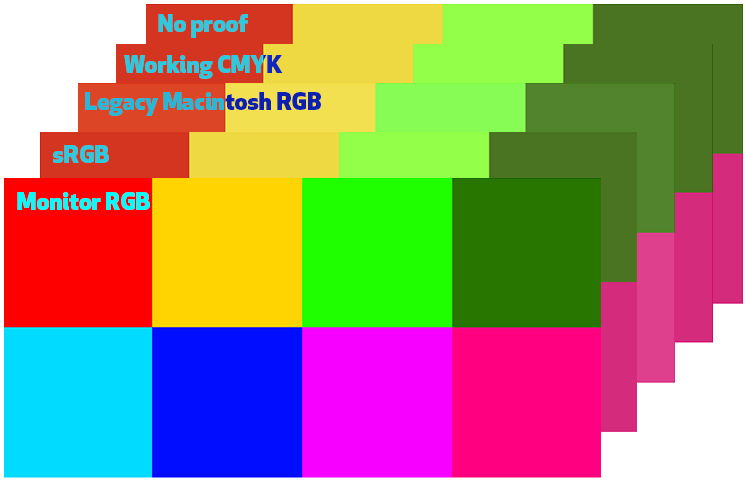 They also need to be in RGB format, not CMYK. If at all possible, text should really be approved and signed off, before any real animation work can start on it. The amount of text can be a critical influence on timings. A viewer needs to have enough time to read any onscreen text, and consequently this will effect animation and editing decisions. For this reason, text can be a difficult thing to change afterwards. Also, try to spell things correctly before handing over to animators. Make them available please! I prefer OpenType/TrueType fonts, because they are compatible with both Macs and PCs. Mac-only fonts are not very useful for those of us on PCs. Don’t make them too small! If necessary, It is possible to vectorise and scale up graphics inside After Effects, but this does accumulatively add to processing time, and it can sometimes cause glitchy, flickery problems with masks, effects, and render ordering. We need bear in mind the size and shape of the intended media, and work to that. For example, a HD TV screen is 1920 x 1080 pixels. Graphic elements need to be scaled and proportioned to accommodate this. It can often be helpful to make graphics slightly larger than necessary. 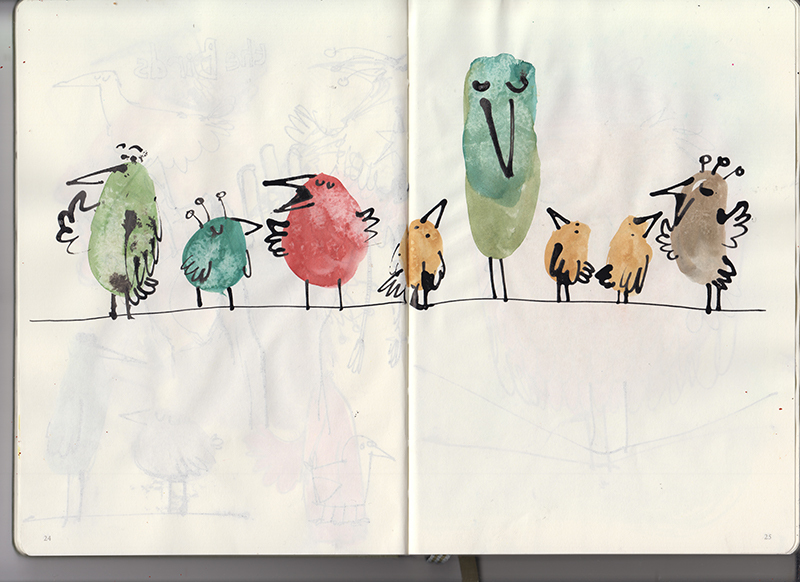 Where possible, try to keep everything consistently proportioned. We can use the path as a “tram-line”, for moving things along. 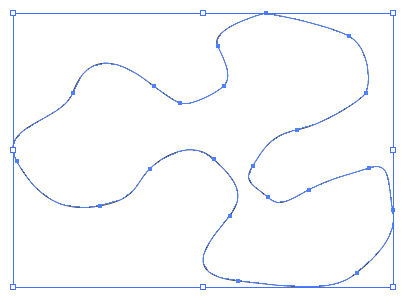 We can animate the line strokes “drawing” on. We can control stroke width directly within After Effects (useful for zooming into maps, etc), as well as many other animatable parameters. 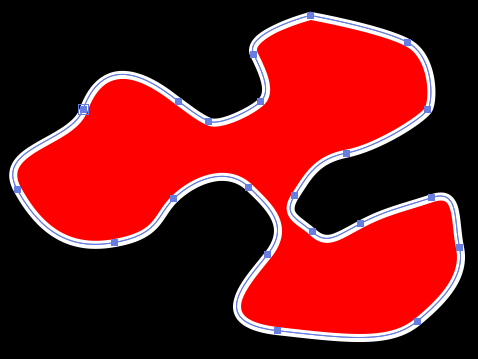 The path can be copied and pasted into an After Effects shape layer, and animated. An Illustrator path can also be copied and pasted into a layer’s position property, and used to create a “tram-line” to move along. Other properties can also be animated, such as strokes. Safe frames are an annoying legacy from analogue television, and unfortunately, they still haven’t quite faded away into history yet. TV broadcast companies can be religiously strict about them. So we do need to be, at least aware of safe frames, especially for any media that might potentially be shown on a television set. Safe frames are, of course, less relevant for media intended for web, computers, mobile, and bespoke devices. I hope this post is useful. 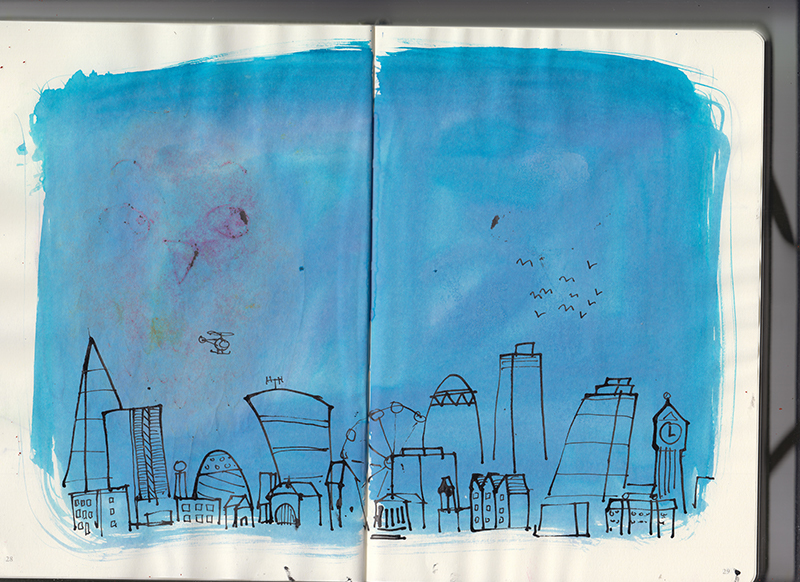 Any comments, good or bad, will be muchly appreciated. Is there anything I may have missed? 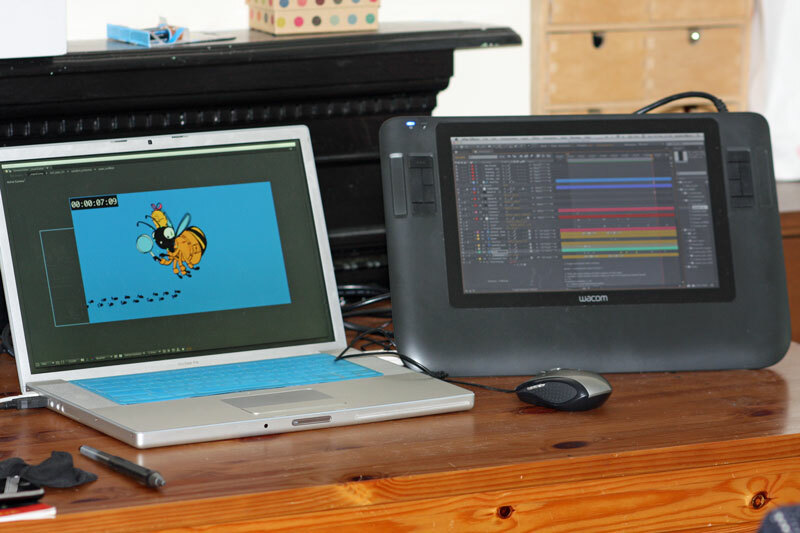 A Wacom Cintiq works well as a makeshift 2nd monitor, when animating on a teeny-tiny laptop. While working at the white-hot coal face of After Effects, I find that I am often asked by wide-eyed youngsters, just how I do I organise my projects? (NB; a complete lie). Being organised is important! As an After-Effects-er, you’ll find yourself dealing with so many files and comps flying around, that it pays to be a bit anally-retentive with your project management. Everyone has their own preferred method in organising their projects, so use what works best for you. The important thing is to be consistent, and to label everything as clearly as you can. This can save your brain from imploding later on. I’ll set up 3 main folders, and I number them, so they appear in the order I want to see them. This is where comps for rendering go. I usually put my main comp inside a container comp, with the appropriate shot name and number. This is so I can seperate my working comps from my render comps. It’s my After Effects equivalent of a Nuke “Write” node. This is where all my working comps go. The main comp will usually go into the root of this folder, and then all the nested comps below that will go into a sub-folder, imaginatively named “subComps”. This is where all my imported assets and footage gets stashed, to keep them seperated from my working comps, and my renderable comps. Within this folder I’ll usually organise assets into contextually relevant sub-folders, eg; ‘Audio”, “PSDs”, “3d_renders”, etc.